Something for everyone in a perfectly planned small space. 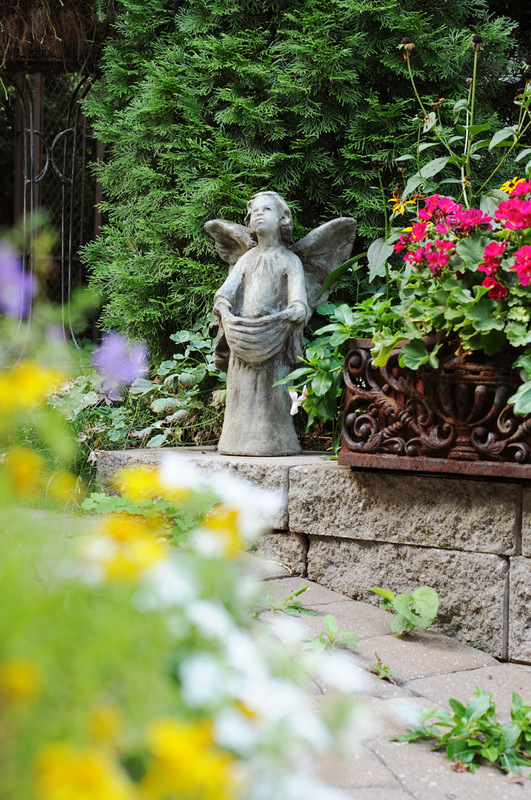 This small garden angel is a signature in Janice Hobson's garden. She mvoes from place to place as the garden matures and the seasons change. With agreement from her next door neighbor, Janice has filled the narrow space between their two buildings with lush, upright greenery. 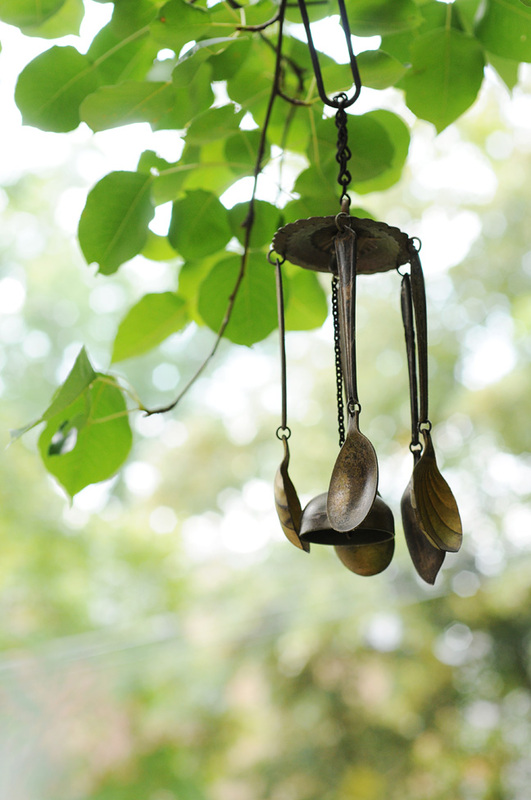 A wind chime made from spoons. The small sign is tucked into a planter in the beautifully compact garden of Janice Hobson’s University City condominium. Other than the gender of the pronoun, the sentiment could not be more perfect. 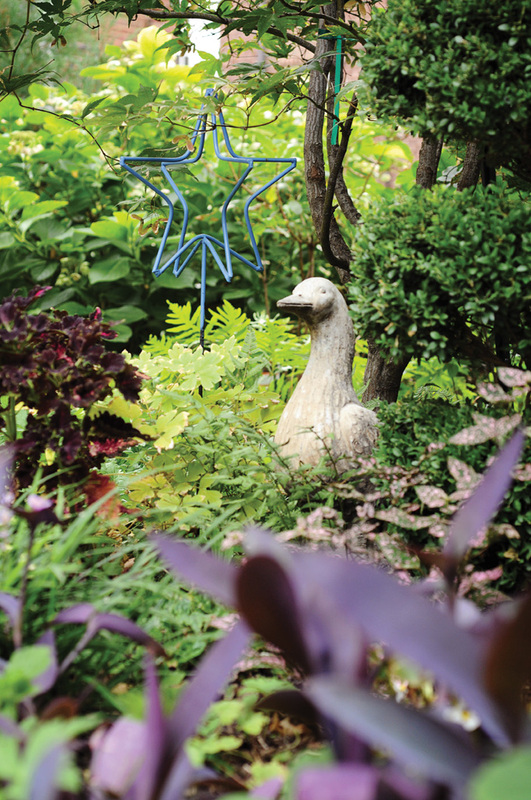 Twelve months a year, bubbling fountains and numerous feeders welcome flocks of joyous, chirping birds to the small space. If human beings could tweet as happily as birds, the people that are drawn to the spot would be singing an equally merry song. Janice’s gardening talents extend around both sides of the house. 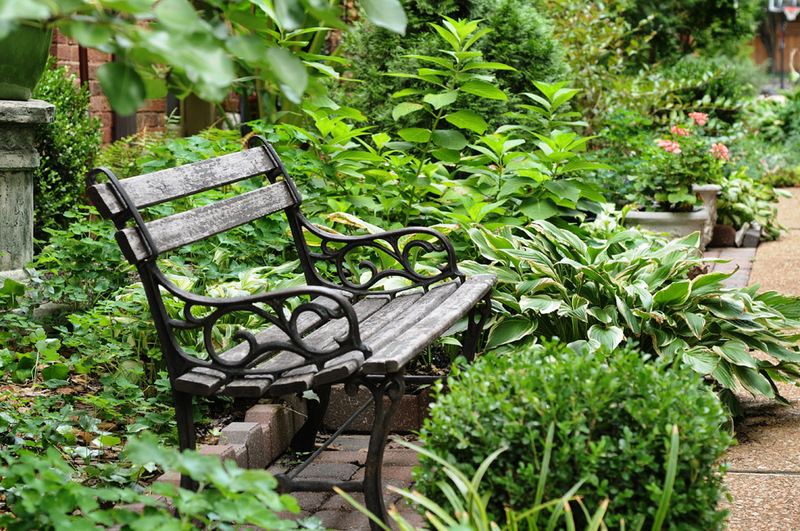 On the street side a mix of evergreen nandina and small conifers interspersed with perennials and ground cover provide lush decoration. 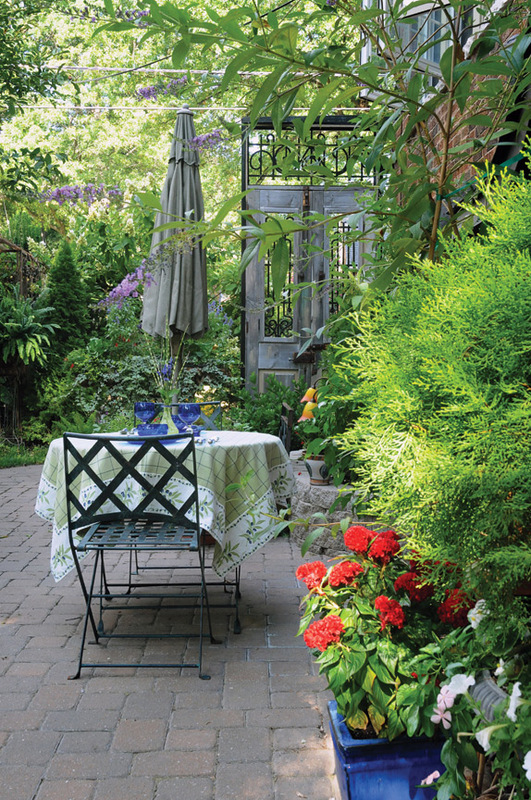 With agreement from her neighbor, she also has transformed the narrow space between her building and his with upright shrubs and shade loving perennials. "His elderly mother used to come out in the space and sit in a lawn chair,” she recalls. “She’s gone now but I’ve named the space 'Loraine’s Alley' in her honor." Three different fountains provide the refreshing sound of splashing water to all areas of the garden. 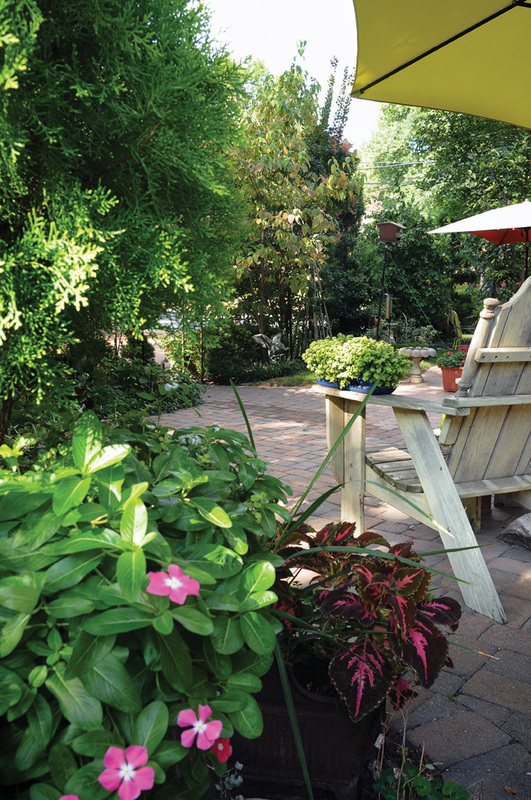 Creature comforts in the courtyard include a wrought iron patio set, a fire pit and two Adirondack chairs perched on an elevated platform for Janice and her husband, Mike Murphy. “We had to remove a large dead tree," Janice says. "The ground just kept sinking where the tree had been as the old roots deteriorated. We finally built up the patio over the area and put out the two chairs. We call it the throne,” she explains with a laugh. Humor is something that Janice intentionally brings to her garden. 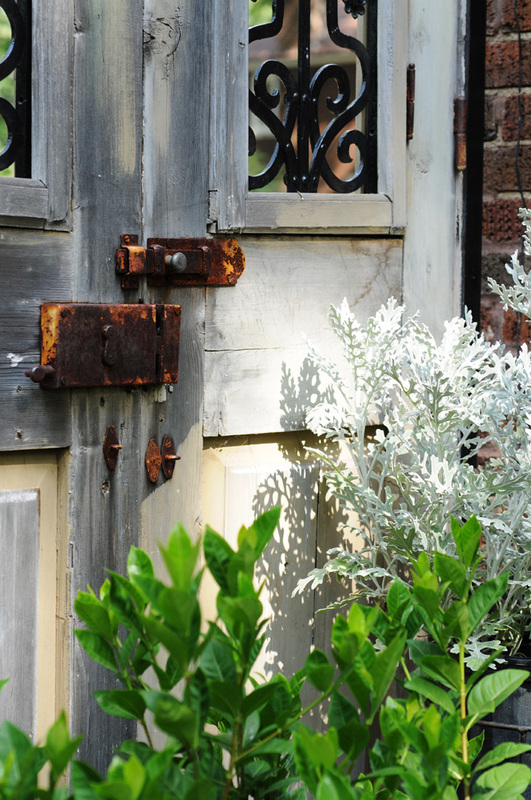 Whimsical, but carefully selected, touches are everywhere. 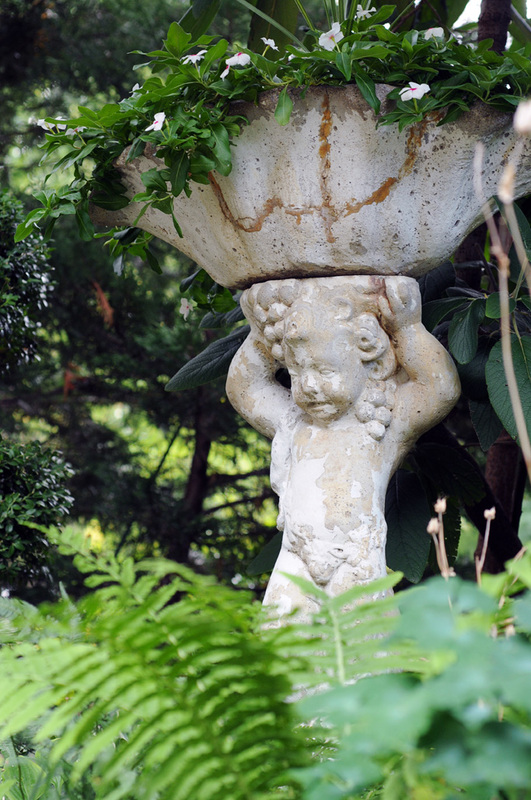 “I like the things in my garden to be interesting, but I don’t want to be cutesy. Sometimes I have to stop myself,” she confesses. Two bronze geese with wings aloft flank the wrought-iron archway at the back of the garden. “I just saw them and liked them. I was kind of envisioning them in our space in Colorado (Janice and Mike have a condo in Steamboat Springs), but somehow they landed here,” she explains. “Their names are Wilber and Orville.” A large, black, stone raven perches on the eave hanging over the back door of the couple’s Tudor-style residence. “His name is Edgar,” she relates with an obvious reference to Edgar Allen Poe’s famous poem. 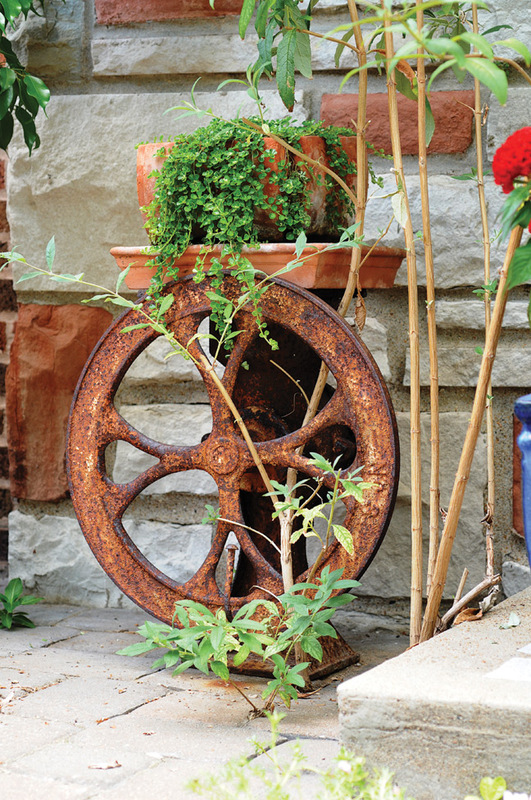 Many of the objects in Janice’s current garden also had a home in the much larger garden that surrounded Janice and Mike’s previous home in the University Hills area of University City. That landscape had the distinction of being selected to be on the prestigious garden tour sponsored by the Missouri Botanical Garden in 2002. Her love of gardening, Janice suggests, came from her mother and grandmother, both avid gardeners. Ironically, her 33-year career as a flight attendant for both TWA and American Airlines also drew her toward the earth. “When I was on the ground, I wanted to be grounded,” she says. Despite her obvious talent, Janice refers to her gardening efforts as “just putzing. Knowing all those Latin names is impressive, but it’s not my speak,” she continues with a laugh. What she has learned about gardening, she adds, she has picked up talking with experts at local garden centers. “I like to support local people; places that are really good,” she says, noting that three favorites are Garden Heights Nursery in Richmond Heights, University Gardens in University City and Sugar Creek Gardens in Kirkwood.